With a demanding job and a lovely but large and sometimes noisy household, I really treasure the time I get to spend immersed in the tranquility of my allotment plot, the Circus Garden, a special place where I can de-stress and unwind. The gentle pace demanded of a simple task like weeding turns it into an almost meditative act on a warm afternoon. Sometimes while I am there in the early evening hot air balloons will rise slowly and majestically into view, having taken off off from the racecourse in the evening thermals, adding to the general sense of peace and calm. I am also fortunate that my site has a number of very friendly plot holders, and it is not unknown for me to spend as much time on each visit casually chatting as I spend on the essential tasks of weeding, sowing, watering and harvesting. But even a small, relatively tranquil allotment site like ours isn’t free of controversy. My plot, the Circus Garden, is tucked into one of the corners of the allotment site, which means that I only have two plots directly bordering mine. As I am resolutely committed to gardening organically I’m fortunate that neither of my immediate neighbours regularly uses pesticides, weed killers or other chemicals near my crops. The same cannot be said for another nearby plot holder, an elderly, loud and opinionated individual who first coined the nickname “Circus Gardener” to insult me as soon as he realised I was intending to garden organically. He is as staunch an advocate of the use of artificial chemicals as I am of organic methods. These days we have reached an uneasy “peace”, in that after insulting me once too often in front of my own children I politely asked him to go away and not speak to me again. To his credit, he did so, and has since found other people on the site to annoy. Every so often I can still hear him complaining in a deliberately loud voice, to anyone who will listen, about “these circus gardeners” who don’t understand that vegetables can’t grow properly without chemicals. What he doesn’t realise is that he is secretly referred to by us organic gardeners on the site as Agent Orange. This is partly because he wears a very distinctive orange bobble hat for about six months of the year, and partly because it is rumoured that his allotment shed is packed with containers of chemicals that were banned by the EU decades ago. Fortunately, Agent Orange‘s plot is far enough away from mine that I don’t have to worry too much about any of his spraying activities affecting my crops, just so long as he does it when the wind is in the right direction. However, there was a rather ugly dispute near the middle of the site last year which demonstrated the dangers of careless use of chemicals. A longstanding mutual dislike between two other plot holders erupted when one of them accused the other of deliberately poisoning his courgettes. This abominable act, he claimed, had led to an extremely serious bout of food poisoning for him and his dinner guests. I remember him telling me that he was so certain in his allegation that he had sent samples of his remaining courgettes off for analysis. He never did tell me what happened after that but I’m told by another plot holder that when the lab results came back, the analysis had identified traces of an artificial fertiliser, the same fertiliser that he had been using, clearly overzealously, on his own plot. He had used so much of it that he had inadvertently contaminated his courgette crop. It was he who had poisoned himself and his guests. Let’s turn our attention to the uncontaminated, organic courgettes that are currently to be found in abundance on the Circus Garden. 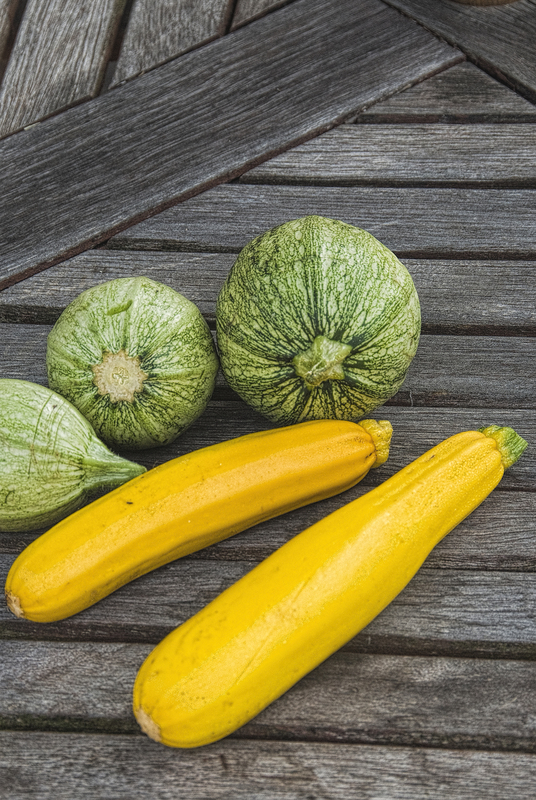 This year I’m growing two varieties – yellow zucchini and the round Rondo di Nizza. Two or three plants is all that is needed to keep my family of six with a steady supply of fresh organic courgettes for a good three months or more. I find that courgettes take on an extra dimension of flavour when they are chargrilled. I’ve used them this way as a key component of today’s recipe, a savoury tart packed with goodness and the warm, rich flavours of the Mediterranean. Serve it with a crisp green salad. If you leave it to go cold and and then slice it up, it would also be great as part of a picnic. 1. First make the pastry. Put the flour, salt and butter in the bowl of a food processor and mix together at the lowest setting until it looks like fine breadcrumbs. Add the egg and the water. The mixture should soon form into a pliable ball. If necessary add a very small amount more water, but always underestimate and go for a little at a time. Remove the pastry from the food processor bowl, roll into a ball and flatten slightly to a thick disc shape (this makes it easier to roll out later). Wrap in clingfilm and place in the pastry in the fridge for 30 minutes. 2. Very gently toss the aubergine and courgette strips in a bowl with 2 tbsp of the olive oil. 3. Heat a ridged grill pan until it is very hot then place strips of the aubergine and courgette across the ridges. You will need to do this in batches, being careful not to crowd the pan. Don’t be tempted to move the strips, other than to turn them over, while they are cooking. When they have charred lines on each side they are ready. Drain on kitchen paper and pat dry to remove excess oil. 4. Pre-heat the oven to 170˚C (325˚F, gas mark 3). 5. Now for the filling. Heat the olive oil in a frying pan over a medium heat, add the onions and cook until soft, which will take around 5 minutes or so. Add the garlic and cook for a further minute, stirring to ensure the garlic does not burn, then add the tomatoes, the basil and the oregano. Lower the heat and simmer, stirring frequently, for a further 10 minutes, by which time you will have a fairly thick, rich sauce. Remove from the heat and leave to cool. 6. Roll out the pastry and line a greased flan case. Trim the pastry so that there is a slight overhang of about 1 cm. Any unused pastry can be frozen for use in the future. Prick the base and sides with a fork and line the flan case with parchment and baking stones or beans. Bake the flan casing blind in the preheated oven for 10 minutes. Remove from the oven, leave to cool slightly and then remove the parchment and baking beans. The edges of the flan will have shrunk slightly, but now you can trim them neatly to the height of the flan dish with a sharp knife. 7. Now you need to assemble the tart, which should be done in layers, as follows. Put a couple of tablespoons of the tomato sauce in the base of the tart and spread evenly with the back of a spoon. Scatter the chargrilled aubergine evenly across the top. Now add another two tablespoons of the sauce, spread evenly and scatter over the sliced peppers. Add another two tablespoons of the sauce, spread evenly and scatter the courgettes evenly over the top. Cover the courgettes with any remaining sauce, then scatter the olives and capers over the top. Finally, sprinkle the mozarella and Parmesan evenly over the top. 8. Bake in the oven for around 50 minutes, or until the top is beginning to turn a golden brown. 9. Remove from the oven and let the tart rest for a few minutes before serving. Will definitely be trying this. Courgette is my favourite vegetable at the moment. Lovely! I made this today and substituted yellow squash for the courgette since I couldn’t find it here (I live in Argentina). I also omitted the capers, but it tasted superb nonetheless!!! Thanks so much for your lovely comments about my blog, and for the feedback on this recipe. I think every recipe should be used simply as a guide and that the cook should substitute ingredients to reflect what they prefer or indeed what is available, so I fully approve of your changes and I’m glad it worked so well for you!